BlackLogic is a Canada based VPN provider that offers secure and reliable VPN services. Established in 2006, the company also provides technology consulting and manages over 350 servers around the world. In this BlackLogic Review, we reveal the pros and cons of the service along with the reasons for subscribing to it. BlackLogic has its servers spread across 7 different countries. 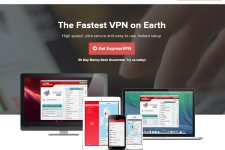 The service covers important VPN markets like United States of America, United Kingdom, Canada, Germany, Netherlands, Russia and Czech Republic. The service is especially useful for people looking to unblock content from US, UK and Canada since they have maximum number of servers there. The server switches are absolutely free of cost and you can change your VPN server as many times as you want. In essence, BlackLogic is a great choice to unblock sites like Facebook, Gmail, Hulu, Twitter, Skype, Pandora, BBC iPlayer among several others. The service offers excellent speeds with unmetered bandwidth. The company has excellent infrastructure in place that allows you to get extremely fast speeds even for P2P activities. This makes BlackLogic an excellent choice for anonymous browsing, streaming movies, online gaming, downloading and sharing huge files as well as for activities that are banned in certain countries, such as online Poker. BlackLogic uses 128 to 2048 bit encryption to secure its traffic. This gives you an extremely secure internet connection that allows you to bypass Government and ISP based restriction with ease. The BlackLogic Company does not keep a log of its users’ activities so you can browse the internet and download content anonymously. The BlackLogic VPN service supports common VPN protocols like SSTP, L2TP/IPSec and PPTP. This makes it possible to use the service from almost all types of computer systems as well as mobile devices. Support for Windows, Linux, Mac, Android and iOS is standard and the set up and configuration can be done within minutes. BlackLogic offers support through live chat, email, ticket system and Skype. With live chat available only during business hours, emailing and ticket system is often the fastest way to get your technical problems resolved. 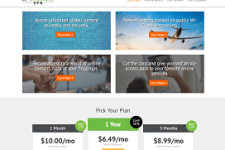 The unmetered bandwidth plans start at $15 per month. 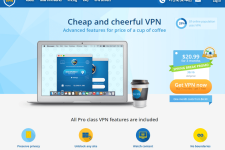 The company also offers dedicated country based plans such as US, EU, Canadian VPN plans as well as pans for specific activities such as VPN for Poker plan, Premium VPN plan as well as static IP VPN plan. It is possible to save money on your subscription by subscribing to long term plans and by using BlackLogic coupons. It may take up to couple of days for your account to get activated since the company approves each and every account manually. The company also offers a money back guarantee if you are not able to set up or use the service for some reason. Overall, BlackLogic is a great VPN service provider. While the company may not have a lot of location choices, it does offer secure and fast VPN service that can be used for a variety of activities. 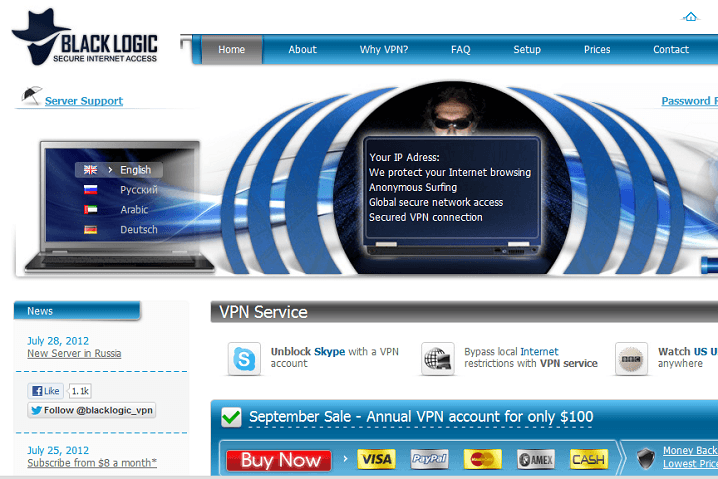 So if you are looking for an affordable VPN service that delivers the goods then BlackLogic is worth a look. To learn more about BlackLogic and their plans, please visit them on the web at: www.blacklogic.com. I have read several excellent stuff here. Certainly value bookmarking for revisiting.I surprise how a lot attempt you put to make any such magnificent informative web site. $15 down the toilet. Yep, Blacklogic is a scam. I’m glad I didn’t pay by credit card otherwise they would probably bill me again and again for no service. Stay far away from these crooks. I wish I’d listened to all the negative reviews on 3rd party websites before subscribing to their “premium” VPN. Don’t pay attention to the comically positive reviews on their website. They’re obviously either shills or written by the company themselves. It took them 6 days just to setup my VPN after purchase. Their support is terribly slow (I mean days at a time to fix an error or respond to a simple question), and they billed my account 5 days before it was due. 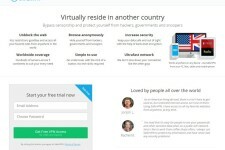 You can easily find a cheaper, more reliable VPN. This product is overpriced garbage and a borderline scam.